A port became so busy with handling components for renewable energy projects it took up an offer of using space at a nearby football stadium. 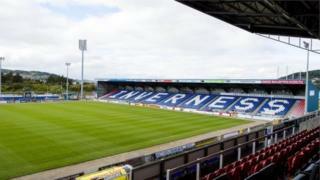 Inverness Caledonian Thistle FC gets a "thank you" in Port of Inverness' new annual report. The port handled deliveries of parts for wind farms in the Highlands. Three 76 tonne kiln drying parts for a chip wood plant near Inverness and parts for a Shetland desalination project were also unloaded at the port. In the annual report, chief executive Sinclair Browne said: "At one point during the year our own facilities were so busy we had to utilise space at the Tulloch Stadium, and I would like to express thanks to the team there for their assistance in producing an excellent result all round."